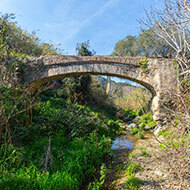 This single-arch aqueduct served to transport water over the slope of Pineda Creek through a conduit, from Can Bauveta Mill to Castellar Mill, while also providing water to surrounding fields. Traditionally it was presumed to be of late Roman origin, but archaeological studies disproved this hypothesis, tracing its construction date to the 17th century. The aqueduct lost its original use in the 19th century, even though it has been often used by locals to cross the river. The aqueduct lost its original use in the 19th century, even though it has been often used by locals to cross the river.